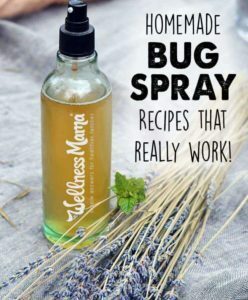 Home Health All-Natural Homemade Bug Spray Recipes That Work! At my house, we joke about mosquitoes being the size of birds, and they certainly do seem to come in flocks! Keeping bugs away with a good mosquito repellent is a top priority, especially with small children who are prone to scratching mosquito bites. What’s the Deal with DEET? While I am serious about avoiding bug bites, I don’t want to use nasty chemicals like DEET to do it. DEET is present in many commercial insect repellents and has mixed results when it comes to safety. The EPA weighed in on DEET in 1998 and again in 2014, saying “it does not present a health concern to the general population, including children.” Looking at their long list of warnings and precautions, I’ll stick with my natural bug spray. In the same study, Dr. Abou Donia found that DEET caused “neurons to die in regions of the brain that control muscle movement, learning, memory and concentration.” The pharmacologist says that children are at a higher risk for brain changes after DEET exposure because their skin absorbs it more readily. It’s also interesting to note that as of 2018 the EPA has yet to complete an endocrine disruptor screening on DEET, so that data is still unknown. This recipe takes just seconds to mix up and can be varied based on what you have available. I’ve included several variations so you can try whichever one you have the ingredients for. 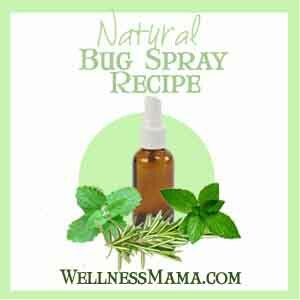 If you have the ingredients to make it, this is the best bug spray recipe I’ve found. 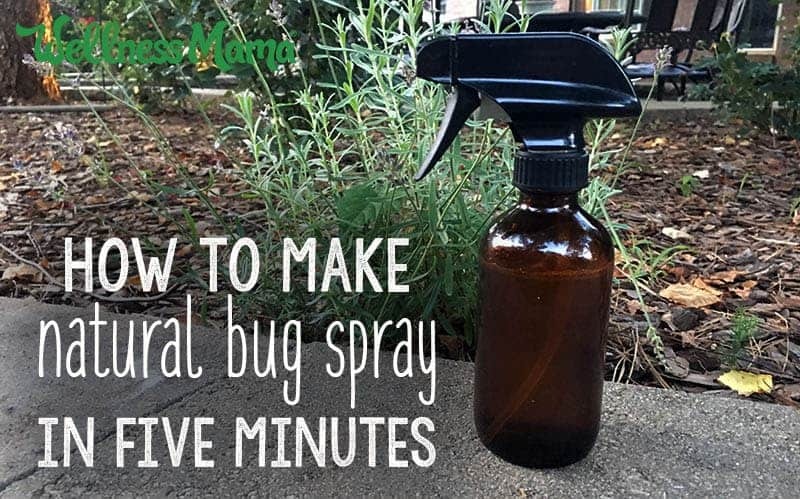 This recipe uses essential oils, which are highly effective for natural bug protection. There are some concerns about putting these directly on the skin, especially on children. I prefer to use this recipe on clothing or gear instead of directly on the skin. Any combination of these essential oils will work: citronella, clove, lemongrass, rosemary, tea tree, cajeput, eucalyptus, cedar, catnip, geranium, lavender, mint. All of those have insect and mosquito-repelling properties, and I’ve included the mixture I use below. For this recipe I use 100 drops of essential oil total with a mixture of various oils. If you don’t have one, you can leave it out or use a mixture of the others in its place. To save time, I’ve also just used a pre-mixed kid-safe essential oil blend formulated to repel insects in place of the other oils in the recipe below. 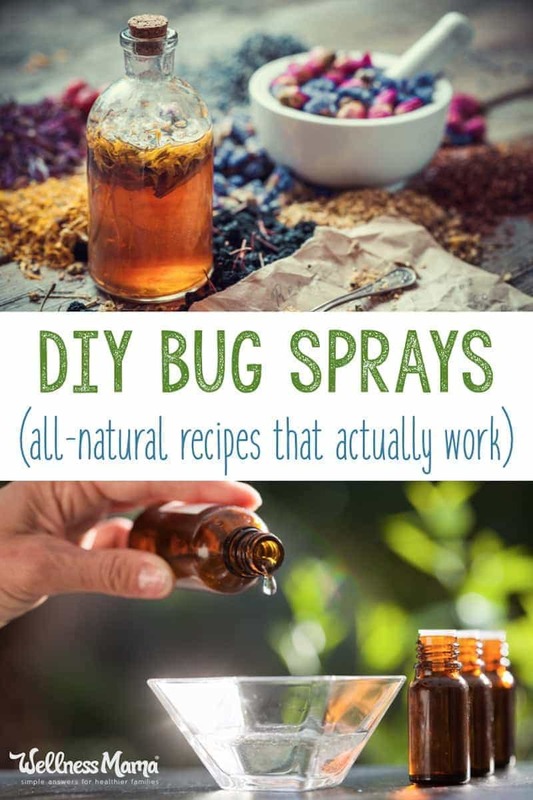 If you’d rather not DIY, Badger also makes a great natural bug spray with essential oils. Add ½ tsp vegetable glycerin if using. This is not necessary but helps everything stay combined. I keep a bottle by the back door for easy application, and also in our first aid kit when camping or hiking. I also carry this homemade anti-itch cream in case of the random bug bite! Boil 1 cup of water and add 3-4 tablespoons of dried herbs total in any combination from the above. I use 1 tablespoon each of peppermint, spearmint, catnip and lavender, and also throw in a couple of dried cloves. Strain herbs out and mix water with 1 cup of witch hazel or rubbing alcohol. Store in a spray bottle in a cool place. We often keep ours in the fridge for an extra cooling spray. TIP: If you have the time and want to make a stronger version of this recipe, prepare the herbs in an alcohol mixture as a tincture instead, and use this directly as a spray after straining out the herbs. Fair warning: this stuff stinks when it is wet, though the smell disappears as it dries. It works incredibly well though, and this is the one I use when I’m going to be in the deep woods or other tick-infested areas. It is based on a recipe that was supposedly used by thieves during the Black Plague to keep from getting sick. They used it internally and externally to avoid catching the disease and to keep the flies and other pests away. According to legend, it worked and they survived… but it definitely makes a great insect repellent these days! This recipe is also very inexpensive to make and you probably already have the ingredients in your kitchen. Note: This mixture is very strong and has antiviral and antibacterial properties. It can also be used as a tincture for any illness. For adults, dose is 1 tablespoon in water several times a day. For kids over two, the dose is 1 teaspoon in water several times a day. Use a non-toxic, plastic-free insect-repelling band like these, which is easier to use on children and very effective. Plant insect-repelling herbs in your yard. I grow lavender, thyme, mint, and citronella near our patio and we use these fresh plants as bug repellent in a pinch. Rub fresh or dried leaves of anything in the mint family all over skin to repel insects (peppermint, spearmint, catnip, pennyroyal, etc. or citronella, lemongrass, etc.). Basil is also said to repel mosquitoes and I’ve used fresh basil leaves in the garden with great success before. I definitely recommend spot-testing for allergic reactions anytime you’re using a new product on skin, whether it’s natural or not. What are your tricks for keeping bugs at bay? Which do you think is worse… the insects or the chemicals in most repellents?